Been here many times, excellent for a cold cider on the decking and watch the boats/swans, even though you get a plastic glass. Our group had food on this visit, again outside and a little to our surprise seeing previous reviews, it was very good pub grub. Staff were pleasant enough, if obviously only there for the season. All in all, quite a positive experience. 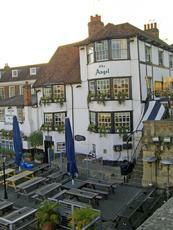 The Angel On the Bridge is one of those places that everyone knows where it is but few have been inside. We arrived here after a wet walk at around 1400. Only 3 people in the pub, who decided to make some comments about our damp condition. Two of them then promptly left. The pub inside is quite small, smaller than I expected, with a number of small rooms and areas to sit in. Good view over the river of course. Beers were Brakspears Bitter and Oxford Gold and Ringwood Boondoggle. We had the Boondoggle which was fine although a little pricey. We had no food. 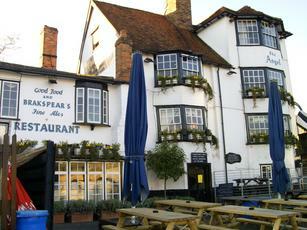 The place was OK but had nothing really to distinguish it from many other pubs, both in Henley and elsewhere. What can I say about this pub? Hideously rude landlord? Yes! Outrageously priced drinks? Yes! If this is your sort of thing then this the place for you! Seriously, couldn't believe how rude the landlord was to us, seemed peeved that we were occupying tables and not ordering food (even though we subsequently did go on to order food). Resulted in the landlord telling us to "F off" (though not this edited version of the F word). Can't comment on the food as we didn't stay long enough to eat it! Disgusting behaviour and he clearly doesn't seem to understand that the customers are his most precious commodity. Would not return if you paid me. Went here yesterday as part of the "Brakspears Henley Ale Trail" as you would expect on a nice sunny Lunchtime the Riverside Patio was packed. I chose not to go outside because the Pub insisted all drinks for outside were served in Plastic Glasses. As we all know beer does not taste good in them. This establishment is more of a Restaurant than a pub but never the less the Brakspears Bitter was on Fine form. This pub was one of the more expensive in Henley but you are paying for the Loacation and Views. Worth a visit in nice weather. Stunning position on the Thames and much-photographed exterior, but I found it a bit disappointing inside, not knowing if it�s a pub or restaurant and strange mixture of d�cor.